Keeping a settled back four could be essential in seeing Luton rectifying their defensive woes according to Paul Benson. The Hatters have had several centre half partnerships so far this season, with Scott Cuthbert, Magnus Okuonghae, Luke Wilkinson, Steve McNulty and Mark O’Brien all taking their turn. 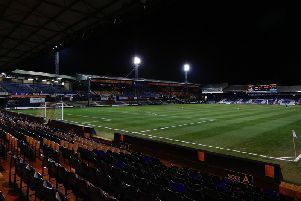 Meanwhile, Cuthbert, Sean Long, Scott Griffiths and Alex Lawless have been given their opportunity in the full back roles, but Hatters have still conceded a hefty 32 times, including eight in their last two home matches. Benson said: “We haven’t really had a settled back line for game after game after game if you’re going to look for excuses, that could be one. “You think when you lose (Steve) McNulty maybe we’ve lost a leader there, but we’ve got leaders. “Wilko (Luke Wilkinson) can lead the defence, he’s loud and vocal, Mags (Magnus Okuonghae) is vocal, Scotty Cuthbert, they’re all sort of what you’d look to for leaders at the back. “But maybe we haven’t found the right combination across the back-line. I don’t know what the stats are that the back four has been the same week after week, so it might be a reason why we look so vulnerable. A consistent spate of injuries robbed former boss John Still of being able to continually select a consistent back four, but Benson believes the squad should be more than good enough to cope. He continued: “Injuries are going to hinder you no matter who you are, but I think we’ve got a good enough squad for injuries not to be a problem. “Personally, with the players we’ve got in and around the squad, they are good enough. Whether they are in the right form or not, they’re good enough as individual talents. Whether they’ve done enough when they’ve come into the side, it’s not for me to say. With Luton travelling to Exeter tomorrow, Benson has urged the defence to deliver a shut out and give his side every chance of arresting their recent slump. He added: “I honestly think a clean sheet and a ground out 1-0 win could be where it starts to turn then we can get into the habit. “You get into losing habits, and get into winning habits, habits of keeping clean sheets and habits of scoring goals.